Daily Evening lighting at Brindavan Garden from 7:00 PM to 8:00 PM. Brindavan Gardens of Mysore is undeniably one of the best terrace gardens in the world. A must sightseeing place of a Mysore tour, Brindavan Garden mesmerizes everyone. It is located about 12km towards the north west of the Mysore city. Brindavan gardens with its illuminated fountains, botanical park, extensive varieties of plants and fulfilled boating, is place for everyone. Especially famous for its symmetric design and illuminate terrace gardens, Brindavan Gardens was built by Sir Mirza Ismail, the then diwan of Mysore state. He was the brain behind its modelling and conceptualization. Spread across an area of more than 60 acres, this garden is laid out in three terraces, and ends in a horseshoe shape. Primarily a terrace garden, Brindavan Gardens have been built in the complex of KRS Dam. The creation of these gardens began in the year of 1927, when the department of Horticulture started the work. It is said the work was completed in 1932. It was the idea of Sir Mirza Ismail, the then diwan of Mysore state to beautify the area around the Krishnaraja Sagar Dam (KRS Dam) which is located in situated in Srirangapatna taluk of Mandya district. This dam, named after Krishnaraja Wodeyar IV, has been built over Cauvery River, which is one of the prominent rivers of South India. Brindavan Gardens have been designed by seeking inspiration from Shalimar Gardens of Kashmir, which have been created in the ancient Mughal style. Hence, it also radiates grandeur and beauty, comprising of a wide array of fountains, terraces, water channels, parterres, lawns and flowerbeds, etc. The dam site is now being maintained by the Public Works Department, Irrigation department, the Police Department and the Karnataka State Tourism Development Corporation. Offering an entrancing beauty, dotted with innumerable fountain and captivating illumination, these terrace gardens are sure to allure every visitor. Brindavan Gardens are divided into various parts - the main gate area, South Brindavan, North Brindavan and Children’s Garden. The main gate area is inspired by the India Gate of New Delhi, presenting an admirably imposing structure. On both the side of the main gate, there is rose garden. The magnificent structure of main gate with the beauty of rose garden presents a perfect entrance to the garden. The lawns, flowerbeds, hedgerows have also been maintained stunningly. The area near the Cauvery Statue is the South Brindavan. The ground in front of this statue is the Kaveramma circle, which boasts of magnificent huge water fountains. Even terrace garden of differing styles can be spotted from here. On the slopes of the terraces you can see Bougainvillea and allamanda plants, while the lawn in the terrace garden has flower beds and patterned hedges and in the centre you can see Cypress plants. Various fountains and dwarf plants can also been found on the terrace garden; in the night these fountains are illuminated. South Brindavan also has a glass house that consists of various ornamental plants which are used in the garden; these plants are also available for sale. Just beside the South Brindavan, there is Children’s Park, which is located towards its right. The park is an apt place for kids to play and enjoy, with its slides, concrete animals, birds, etc. and various other items. North Brindavan is the most attractive area of the gardens as it comprises of four vast terrace gardens, with each terrace garden offering a breathtaking view of lush green lawns, flourishing flower beds, decorated hedges, and ornamental trees. What make these gardens even more attractive are the various fountains illuminated with colourful lights. There is also a nursery of ornamental plants. A visit to Brindavan Gardens becomes even more enjoyable with the boat rides. As there is River Cauvery between North Brindavan and South Brindavan facilities for boating are offered by the Karnataka State Tourism Development Corporation. Boating on the serene waters of the river, with the entrancing beauty of Brindavan gardens around you is sure to make a Mysore trip memorable. 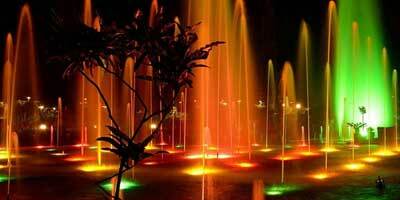 Another popular feature of the Brindavan Gardens are the musical fountains. The fountains are maintained by the water pressure from the dam and are operated through a controller. The musical fountain show presents a harmonized water dance, accompanied by colourful lights and music. For visitors, a rain shelter and gallery has been built. This show organised at the North Brindavan. The illumination timings at Brindavan Gardens Mysore differ with the change of months. The illumination timings from the month of January to September are from Monday to Friday at 6.30 p.m. to 7.30 p.m. and 7.00 p.m. to 7.55 p.m. on weekdays it is from 7 p.m. to 8.55 p.m. During the month of October to December, the timings are from 7 p.m. to 8.55 p.m. on weekdays while on Saturday and Sunday, it is from 7 p.m. to 8.25 p.m. The opening timings of Brindavan Gardens are from 06.00 am - 08.00 pm throughout the week, while on weekends, it is from 06.00 am - 09.00 pm. A minimal entry fee is charged for the visitors to enter this breathtaking site. While visiting Brindavan gardens, there are a few things to keep in mind. Videography is prohibited here and a fine of Rs.50/- is charged for any unauthorised use of camera. Lodging and boarding facilities are offered at the Hotels and Inspection Bungalow. In the areas around KRS Dam, along with Brindavan Gardens, Department of Horticulture maintains a few other gardens as well such as Government fruit orchard which is spread over an area of 75 acres, Naguvina Horticulture Farm over 30 acres of area and 5 acres of Chandravana Horticulture Farm. Cacti and Succulent Garden is also worth watching.